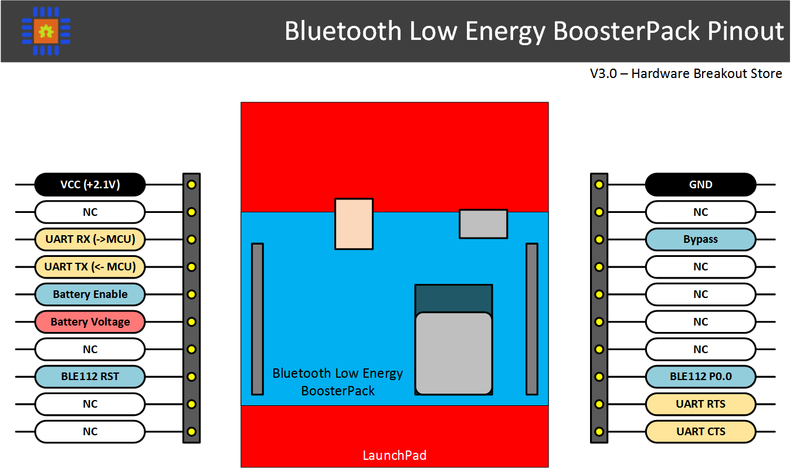 I would like to introduce the Bluetooth Low Energy (BLE) BoosterPack for the LaunchPad, built around the BLE112 module from Blugiga. Lately, I have been too busy to post new material because I have been working on an easy to use BLE BoosterPack. I’m actually very proud of the result, and am finally ready to add the board to Hardware Breakout’s webstore. Be sure to check out the User Guide for detailed information on the board’s features and example code (on GitHub). For those of you not familiar with BLE, it is a version of Bluetooth that was designed for ultra-low-power devices. While it has a reduced data rate, it is simpler to implement and consumes significantly less power. If you have a wireless project that needs to have the longest battery life possible, this is the BoosterPack for you! While the BoosterPack system is great for having multiple boards, I often wanted multiple boards combined into one. This is why I included all the power circuitry necessary, including a Lithium battery connector, on the BLE BoosterPack. After all, almost every project I have used BLE in was battery powered. Another reason for integrating the power circuitry is that a special high-efficiency switching regulator (TPS62730) is needed in order to optimize power consumption. The BLE112 module from Blugiga is great, it allows for custom firmware development and programming without expensive tools. You can even update the firmware via the on-board USB connector, or use the device as a BLE dongle for a PC. This BoosterPack can even act as a stand-alone system, since the BLE112 module contains almost all you need for a simple project. Having quality example code that can be easily modified for your own purposes is very important. I have release an open source Python module with example code and an Android application that allows you to easily get up and running with BLE. Stay tuned to the Hardware Breakout blog for more information on the example Android app and Python module in the coming days. While the design is completely finished and verified, I have decided wait on shipping the first batch of orders till the end of May. This decision was made to keep costs down. The more orders I can group together during the initial assembly, the lower the overall prices will be. Be sure to stop by the Hardware Breakout Store and pre-order one today! How to run the python code on MSP430 launch pad ?? The Python code does not actually run on the MSP430. It runs on your PC. It allows you to interface with a BLE device using the BLE dongle from Bluegiga. What is the V_BATT signal in schematic ( I bought two PCB) and as I undestand - I need ONLY on power regulator (not both). This power just for BLE or for LauncgPad too ? There are voltage regulators footprints on the BoosterPack. One switching regulator that is difficult to solder, and one linear regulator that is easy to solder. If you are assembling the board yourself, please populate only one of these regulators. I recommend using the switching regulator as it requires fewer components and is easy to solder. Additionally, the on-board regulator is only needed if you are using battery power on the BoosterPack. If you would like to power your project through the LaunchPad itself, you do not need the voltage regulator and can disconnect JP3 (the VCC jumper). When this jumper is closed, it allows the BoosterPack's battery to power your LaunchPad. The V_BATT signal in the schematic is directly connected to the positive terminal of the battery. Please let me know if that did not answer your question, and I will do my best to clarify. I'm in the need of a platform which allows me to write info on a memory (when buttons were pressed and for how long), and then access that info with a client app (made by myself in C or Java) Can I do that with Launchpad? Do you have an example using the Energia IDE? I'm trying to read in data through a sensor into the MSP430, and then send it via Bluetooth to a computer with LabView for analysis. A pity since yours posts are very nice! I would like ( if possible) , u give me somes tips to understand the funcionality and Stack of the kit RF Boosterpack CC110L from Texas and partner Anaren, May you help me please? Thank you for the kind words! I have been far too busy with my full-time job to write blog posts, but I hope to resume creating new posts early next year. I have a lot of really cool things in the queue that I would like to write about. Sadly, I have not worked with the CC100L at all, so I won't be able to give you any tips. I would recommend reading through the datasheet and user guide, as well as asking your questions on the e2e TI forums. uhum.. ok , ty anyway! At least you answered me ! :) So, Im Braziliam I would like to start one blog to talk about electronics and Microcontrolers I love Msp's too, May I starting translating your posts? We are students of Electrical Eng., Universidad de la República in Montevideo, Uruguay. We are planning to use the launchpad MSP432P401R from TI and want to incorporate one BoosterPack with BLE. 1 - Is this BoosterPack pin-to-pin compatible with the MSP432P401R launchpad from TI? 2 - The firmware libraries necessaries to use the BoosterPack are compatible with MSP432P401R? 3 - Wich are the characteristics of supply and consumption of this component? According to the LaunchPad development kid User Guide, the board is compatible with the TI BoosterPack standard (http://www.ti.com/lit/ug/slau597a/slau597a.pdf). Additionally, the BLE BoosterPack has been designed to be configurable to any system. Every pin that is has a jumper in the signal path that allows any signal to be rerouted as needed. 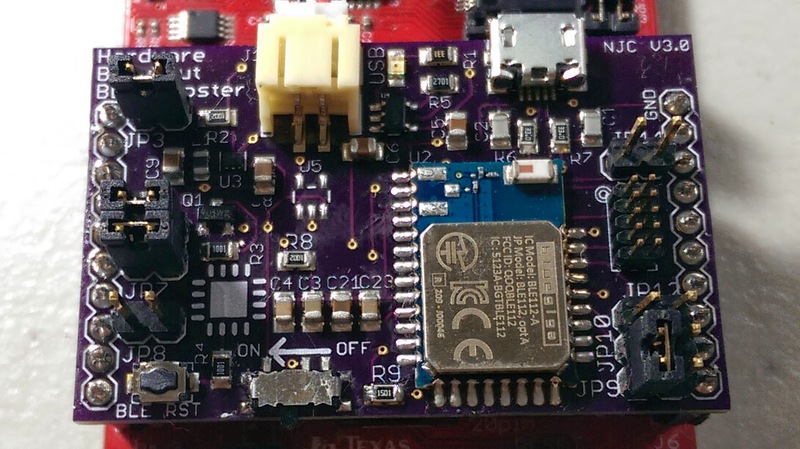 The BLE BoosterPack has been designed to be a UART passthrough. As such, there is technically no firmware libraries necessary to use the BLE BoosterPack. If your application uses UART, you can use the BLE BoosterPack without changing your firmware (as long as the baud rate is low enough). The BLE112 module from Bluegiga is built around the CC2540. If you have any specific questions about that module, I would recommend contacting Bluegiga. As for the firmware that comes pre-loaded onto the BLE BoosterPack, it is not optimized for low-power consumption. It was designed to be easy to use and a drop in UART replacement. However, the BLE BoosterPack hardware has been designed for the lowest possible power consumption. With custom firmware on the BLE112 module and an FRAM based MSP430, the average power consumption was measured at 1.2uA between Bluetooth advertisement packets with an RTC running on the FRAM MSP430. I want to Interface Bluetooth BC 127 MODULE WITH msp430g2 but i dont have any code ref for MSP430 how can i manage its command into C lang code can you pls help me out ?